As velas flickered behind him near a water fountain and a few of his photographs, iconic chronicler of L.A. culture Estevan Oriol addressed the crowd. A semi circle of people surrounded him, a half-dozen phones in the air to capture his words. Oriol thanked everyone for coming and, as the sun slid lower behind the DTLA skyline, he encouraged everyone to drink more and have a good time. It felt like a casual get-together in many ways, but this was the celebration for Oriol’s current rotation in Hotel Figueroa, part of the space’s new artist-in-residency program. 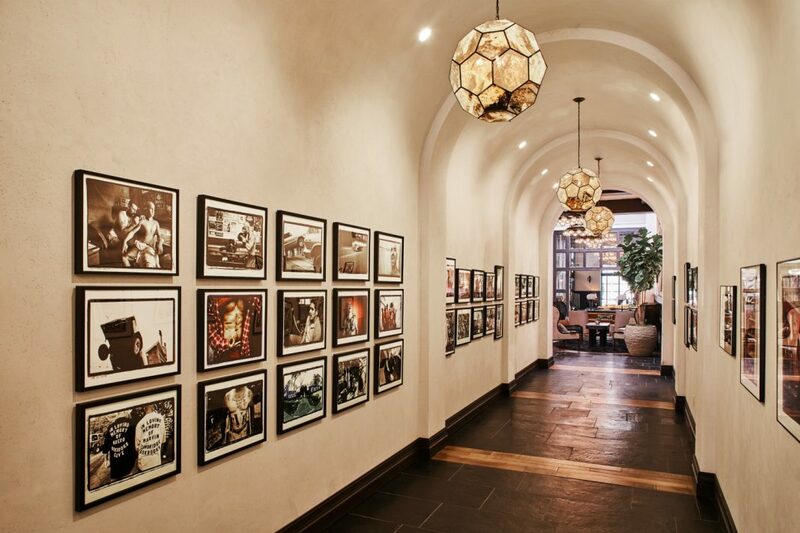 A series of Oriol’s photographs—including some of his most recognizable images of L.A.’s lowrider and street cultures—is currently on display in the recently revamped hotel’s lobby; visitors can view images as they head to the hotel’s pool until October. You may have seen Oriol’s work in magazines, in installations like Beyond the Streets, or at institutions like MOCA and the Petersen Automotive Museum. Now, Angelenos can see his work up close without paying an admission fee. And it’s a nod to the complex history of the city. In a recent interview with Los Angeles, Oriol said that “old-school L.A. looked better for photographs,” and that gentrification made it hard to find the same scenery for his style of photography. When you walk toward Hotel Figueroa from FIGat7th, you pass classic spaces like the Original Pantry Cafe, open since 1924. Just a little farther down sits L.A. Live, a flashy entertainment complex with a gigantic movie theater, pricey bowling alley, and humongous digital billboards. On Figueroa, it seems like the past is continually colliding with the present, like a ViewMaster with the photographs all out of order. Oriol’s series of photos feels like a similar mode of cultural time travel: some images feel very much of their era, while others could’ve been taken yesterday. Reopened in February after a two-year hiatus, Hotel Figueroa has undergone its own transformation. Besides the obvious upgrades, a new addition is the hotel’s collection of art by female artists, a nod to the fact that women first owned and operated the space. In the 1920s, a group of women from the Los Angeles YWCA bought the land where Hotel Figueroa now sits to create a place where businesswomen could safely stay while traveling. Women who booked rooms at the hotel could participate in social activities like swimming lessons and bridge parties. The hotel manager, Maude N. Bouldin, hailed from the East Coast and liked to fly planes. You can see a commissioned portrait of her by Alison Van Pelt hanging in the hotel lobby. Women also figure prominently in Oriol’s ouevre, as seen in the photographs at Hotel Figueroa and also his 2009 book L.A. Woman. The book also has an accompanying calendar, which Hypebeast proclamed “should have all you guys out there fairly excited.” While the women in the photographs may have shocked their forebears at the Hotel Fig, many of the women in Oriol’s photos stare right back at the camera with a sense of agency, even defiance. Oriol’s instinct for capturing L.A.’s subcultures, particularly within the Chicano community, shines through in the collection of photos hanging at the hotel. Images of people with guns drawn could seem out of place in a luxurious hotel, but they’re also a reminder to hotel visitors that the space can’t be untangled from the history of L.A.